In this method of tubal ligation, a loop of tube is “strangled” with a suture. Usually, the loop is cut and the ends cauterized or “burned“. 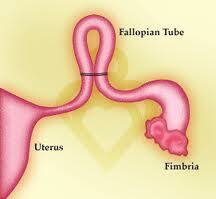 This type of tubal ligation is often referred to as cut, tied, and burned. These are usually very good for reversal. The fact that the ends are burned doesn’t matter because that part is going to be lost anyway during the tubal reversal.